A cross-species friendship between a dog and a lamb makes us think biological boundaries may be a figment of the imagination. The boisterous pair has an incredibly spirited play session together, regardless of identity. The pup springs up and surprises the lamb. To keep the game going, the dog rolls over a ball ...... and the lamb, in response, gleefully tumbles over the dog and ball. The dog nuzzles the lamb. And the lamb nuzzles the dog. Now that's friendship. NOTE: Videos of unlikely animal pairs romping or snuggling have become so common that they are piquing the interest of some scientists, who say they invite more systematic study. Among other things, researchers say, the alliances could add to an understanding of how species communicate, what propels certain animals to connect across species lines and the degree to which some animals can adopt the behaviors of other species. 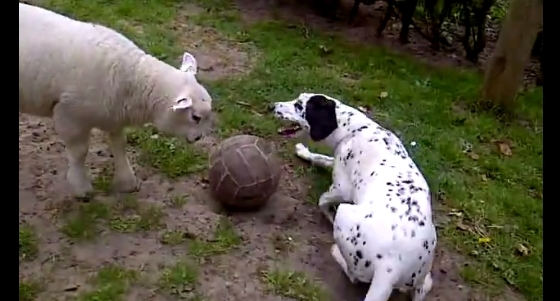 Responses to "Dog And Lamb Wrestle Each Other To The Ground Over Ball (Video)"